Один из лучших отелей из тех, где я останавливался в Индии. Прекрасная природа, чистая улица в центре, 5 минут до Boulevard - центр шоппинга Сринагара. Руф - замечательный, душевный человек, интеллигентный собеседник. אם אתה בא למלון השוויצרי ב סרינגאר אתה בידיים טובות! המלון נמצא במיקום מעולה 2 דקות הליכה מהאגם. היינו בחדר 105 ו שלו היה נהדר. Our goal is the Swiss Hotel recommended in our guidebook and it is an excellent choice. The owner is super friendly, gives us a great rate on a nice room and calls us "genuine travelers". Any overlanders on tighter budgets than us should know he will allow you to camp in their driveway or on their lawn and use the facilities for free. Highly recommend hotel Swiss in Srinagar! Have stayed for 3 nights in June this year with my wife and children, and have felt very welcome and very well looked after! The hotel is 2 min walk to the amazing lake and 10min walk to the city centre. Many walks in walking distance and a few Kashmiri restaurants to choose from. The hotel manager is a real friend to all guests and had great conversations and insights into the local society, etc. Only wish we stayed more :(... But will return!. Stayed June 2014, travelled with family. 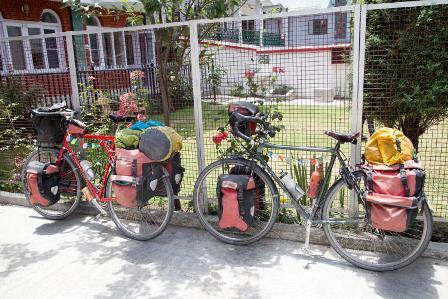 The Swiss is one of the friendliest family guesthouses in India. It’s not showy but has reliably good-value budget accommodation and the new block has hotel-standard rooms at walk-in prices that are significantly discounted for foreigners (online rates are far higher). There’s a peaceful lawn, free fast wi-fi and lots of informed opinion from the tirelessly helpful Sufi-spiritual manager. The area stays calm during curfews. We couldn't have been more relaxed at this amazing hotel. Family run, and a family atmosphere that everyone could feel. Unlike a lot of hotels in India, there's a downstairs sofa area, which acts as a bit of a place to meet other travellers which is good for if you're travelling solo. The owner, Ruf, was more than happy to take his time giving us his advice whenever we needed it, including directing us to what became out favourite restaurant - Lhasa (definitely worth a visit). The rooms are chalet-like and have everything you need, including hot water and air conditioning. Just off the famous Dal Lake, you're in a great location to get around and see Srinagar. It's also one of the only places that's cheaper for foreigners rather than locals, as Srinagar was pretty expensive! We couldn't have asked for a better experience and would stay nowhere else if ever returning to Srinagar! This was supposed to be the last last destination on our 10 day trip from Leh. As expected we were completely exhausted by now. We decided to reach a day early from what we had planned due to the rumours we had heard about getting stuck at Zojila Pass. However, we safely made it to Srinagar and to the hotel. As we had not intimated the hotel about our early arrival, they did not have rooms for us on that day, which was frankly a turn off at the start. The search for a new hotel after such exhaustion was killing us!. However, the hotel's owner - Rauf, went out of his way to make sure we got a place in Hotel Kabir which was right adjacent to Swiss. He made sure we got the room and called me up in the evening too to make sure we were OK and invited us over for some tea. The next day we checked in to Swiss early in the morning as were moving to Gulmarg. When we came back Mr. Rauf was in the hotel and graciously welcomed us. The rooms provided to us were extremely clean and homely. It actually felt like my own flat. However, the best part starts now! We wished to visit Vivanta by Taj Dal lake for dinner but unfortunately had no transport to do so. Mr. Rauf again went out of the way and provided us with his own personal transportation and never charged a buck for it. Instead in his words - "Just go enjoy yourself. Such times are not going to come again in your life!". From what seemed like an extremely disappointing 2 days in Srinagar, this guy managed to make sure it didn't happen! Just one low of this place, does not have its own kitchen. However, I am not complaining! Stayed June 2014, travelled with friends. We stayed in this hotel for 3 nights last week, and we are so glad we did. The hotel is located in the lane opposite Dal lake, it’s a nice and clean hotel, the staff is very polite and helpful. Rooms are clean and provide the basic facilities, just what you need, However, the WiFi is available in the Reception area and not in the rooms. Our whole trip would have been different or may be cut short if we would not have come here and met Rouf, the owner of this hotel. He was very supportive and kind, truly a gem of a person. He guided us for the whole trip, recommended places to visit, suggested things to do and to avoid, saved us lot of unnecessary expenditure, we were little tensed as there was some news of disturbance in the city but he made sure we travel safely and kept checking on us till we reached Mumbai. We really loved the warmth of each and every person at this hotel where it was more important to make people comfortable and happy than just making money. From that day, we know no other hotel in Srinagar and we will make sure anyone who is going to Srinagar visit this hotel. Three cheers for Rouf and his team!!! When Lonely Planet said the Swiss Hotel was "one friendliest places to stay in India" we thought "that's a high bar to aim for" given how friendly we have found everyone. But Rouf and his team Altaf, Mudasir and Ashiq really do provide a home away from home. The large sitting area is great to chat to the 4 of them, or play Carron Ball. We explored the area over 9 days and it made the ideal base. Rouf was always incredibly helpful with tips on where to go, what rates were reasonable and a range of people to go to (hence the review below about links is completely wrong - unless Rouf were to have direct links with absolutely every outlet in Srinagar! As laid back as they come Rouf didn't bat an eyelid when we changed rooms on arrival with different members of the 5 person family looking for different things out of a room. Great sense of humour but essential to give as good as you get when it comes to the banter! Had one great evening on a houseboat but as a base it would be difficult to beat the Swiss Hotel. Abbiamo passato 5 splendidi giorni in Srinagar alloggiando al Swiss Hotel managed by Rouf .Consigliamo di venire in questo Hotel sia per la posizione sia per la calda accoglienza del proprietario e dello staff. 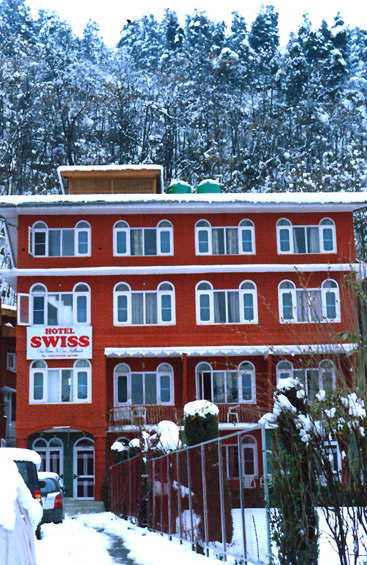 Staying in the Swiss hotel was one of the highlights of travelling in India. Clean rooms, hot showers, reasonable room rates and most of all, hospitable and friendly hosts. We would definitely recommend it and Kashmir as a destination in India. Forget the houseboats, Swiss hotel is the best.